Neil Davey and Jen Dyer are two of the leading proponents of Cornish traditional Celtic music. They are members of internationally acclaimed Cornish band Dalla. Between them they have toured everywhere from Sydney to New York, Tokyo to Vancouver, taking in many prestigious festivals and venues across Europe, including The Royal Albert Hall, Glastonbury, Lorient Interceltic Festival and Celtic Connections amongst UK performances. As much as anything, they love to bring it all back home, where it do belong to be in their native Cornwall, and their performances here have taken in all the main Cornish arts festivals, and celebrated venues such as The Minack Theatre, Eden Project, The Hall for Cornwall and Carnglaze Caverns as well as countless small Village Halls, Pubs, Feast Days and Harbour Days throughout their homeland. 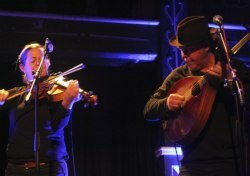 They play bouzouki, fiddle and viola, and the repertoire of Cornish Celtic music, both new and old, ranges from stonking Celtic jigs, reels and polkas, to the exotic almost Balkan sound of some of the Cornish five-steps, as well as some heart-meltingly beautiful and hypnotic slower pieces. Formed as Davey&Dyer only in the last couple of years, but played together in various line-ups and sessions for over 20 years! Suitable for all age-ranges of audience and for can adapt to background music for a wedding/funtion, to a much-more up-beat stonkingly-lively festival stage!